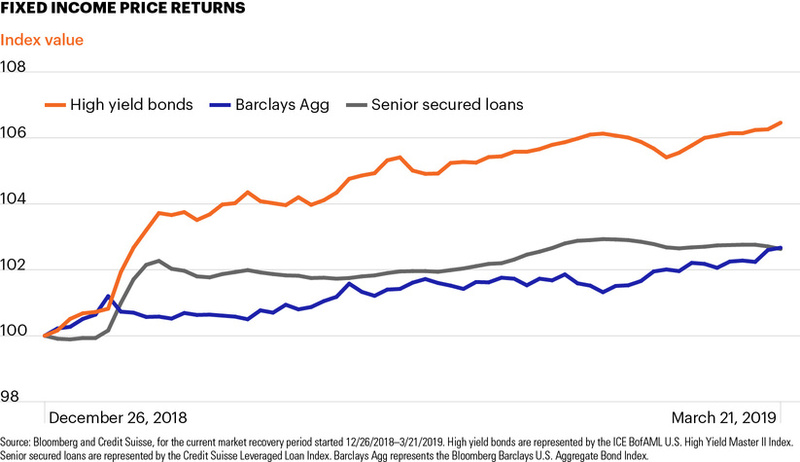 Investor interest in high yield bonds has increased this year as the Fed’s shift has further compressed yields across traditional fixed income asset classes and as the U.S. economy continues to experience slow-but-positive growth with minimal inflation pressures. While the performance of each fixed income class can vary across the phases of a market cycle, the Fed’s recent lower-for-longer emphasis may encourage investors to continue looking beyond traditional core fixed income allocations and diversify their holdings within fixed income, including high yield bonds. 1 U.S. Federal Reserve, https://bit.ly/2Csirr8. 2 Federal Reserve Bank of St. Louis, https://bit.ly/29ecBfp. 3 High yield bonds are represented by the ICE BofAML U.S. High Yield Master II Index. Senior secured loans are represented by the Credit Suisse Leveraged Loan Index. 4 Thomson Reuters Lipper, as of March 22, 2019.